Mount Shinmoedake in southern Japan erupted for the first time in six years Wednesday, shooting a plume of ash several hundred metres into the air and sparking warnings to local residents. 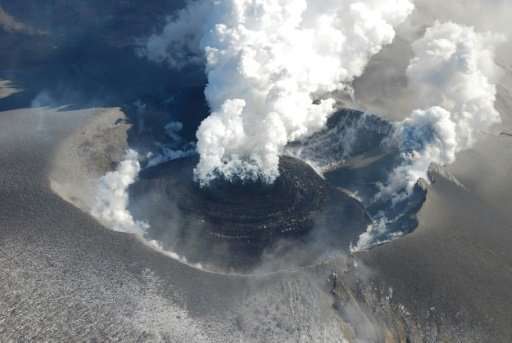 People were ordered to stay away from the volcano after it rumbled to life at 5:34 am (2034 GMT Tuesday) as Japan's Meteorological Agency said air blasts caused by the eruption could shatter windows. "The ash plume reached a height of 300 metres (1,000 feet) when the volcano erupted," an agency official told AFP, adding that the eruption would continue and "become more active". Ash deposits would spread as far as two kilometres from the crater, the agency warned. Authorities raised its alert to level three, meaning that locals should avoid approaching the volcano. They detected 90 small tremors on October 5 near the mountain, which featured in the 1967 James Bond film "You Only Live Twice".